Click here to read this same article on-line at the Abury Park Press site. TOMS RIVER — The Oyster Creek Generating Station in Lacey should only be relicensed if cooling towers are required, critics argued at a forum Wednesday night. Actor Alec Baldwin, who served as moderator, joined several longtime opponents of the power plant in a panel discussion attended by nearly 200 people at the Toms River branch of the Ocean County Library. It was cosponsored by the League of Women Voters of Ocean County and the library. Topics included the health effects of radiation at the Forked River-based power plant. The 40-year-old plant’s owner, Exelon, is awaiting word on whether the U.S. Nuclear Regulatory Commission will issue a license renewal which would permit it to operate for another 20 years. The facility’s license will expire in 2009. League First Vice President Gail Saxer said that her organization invited 11 pro-nuclear organizations to the forum to provide balance, but that each one was unable to send a representative. A number of Oyster Creek employees, however, were in the audience. Among the key concerns Baldwin cited were what the safe level of exposure to radiation for those who live near the plant and the safe storage of nuclear waste. “The safe levels of exposure are never discussed. Bill Richardson (head of the Department of Energy in the Clinton administration) once said that he wanted to build a number of safe smaller reactors. I told him he should so long as he built them on the grounds of the DOE. He didn’t think that was very amusing,” Baldwin said. Baldwin said that the NRC is in the pocket of the nuclear industry. 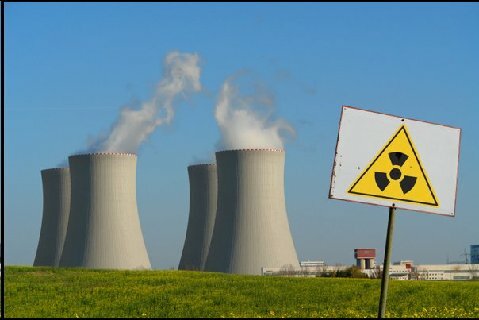 “Nuclear power plants make a nice juicy target. Terrorist attacks on these type of plants are a factor,” he said. “There is a myth that this is clean energy. It is not. Uranium mining is a filthy, carbon-based process,” the actor added. Baldwin has been a longtime supporter of the Radiation and Public Health Project research group, and spoke about its study of radioactive Strontium-90 in baby teeth. The League of Women Voters went on record as opposing the license renewal in 2006. The group cited numerous problems with the plant’s operating systems. A number of members of a coalition of six environmental groups called Stop The Relicensing of Oyster Creek coalition were also for the forum. Baldwin urged residents to write to their federal, state and local officials to request that the power plant’s license only be renewed for 10 years and that a cooling tower system be used to reduce the death toll for sea life. “Don’t let (Gov.) Corzine off the hook. Exelon makes $150 million in profit at that plant. I don’t think they’ll close it down if they have to build cooling towers,” he urged. Another speaker, Donald B. Louria, added: “Cooling towers are an absolute requirement. The Salem and Oyster Creek power plants are responsible for the death of billions of fish. I don’t think that is acceptable.” Louria is a professor and chairman emeritus of the Department of Preventive Medicine and Community Health at the University of Medicine and Dentistry of New Jersey-New Jersey Medical School. Beth A. Rapczynski, the Mid-Atlantic communications manager for Exelon Nuclear, was in the audience. “We don’t think the cooling towers are necessary. They may also cause an environmental problem because it is salt-based and it would go into the air and land on cars, homes and farms in the area,” she said. Also on the panel was Joseph J. Mangano, a health researcher and executive director of the Radiation and Public Health Project. Mangano spearheaded a study of Strontium-90 in baby teeth, the only study ever to examine radioactivity levels in bodies of Americans living near nuclear plants. “We are on the eve of a historic decision here, whether a 40-year-old reactor will be allowed to stay open or if it will be shut down. The question is if Oyster Creek really is safe,” Mangano said. Louria described Mangano’s work as preliminary but scientifically sound, and called for a more extensive study to be conducted by Mangano and paid for by Exelon. An attorney for the coalition, Richard Webster, discussed the status of legal challenges between Exelon, the NRC and the coalition. “We have a court challenge with the NRC. We hope that the NRC will wake up and protect people and not the interests of the nuclear industry,” he said. Exelon’s Rapczynski took issue with Baldwin’s comments about defective radiation monitors, which she said are overseen by state officials and serve as a backup to Oyster Creek’s monitoring system. “We have 90 monitors inside and outside the plant and they monitor for 10 miles. It is a comprehensive system and they are working every day,” she added. Gary Black of Jackson, who supported the plant, said that some studies suggesting that the plant presented a cancer risk have not taken into account the growth in Ocean County in the last 20 years. He added that the plant would still be a potential terrorist target even if it were closed. Saxer said that the evening’s forum was being taped by a CBS news crew for “60 Minutes” and by Hibiscus Productions producer-director Susan Kaplan, who is working on a documentary on the Oyster Creek relicensing issue and its impact on Ocean County residents.